Im happy you are back on the web. I saw your site before i move to indonesia on July. Im heading to Cibodas next weekend. Could be possible top have the site map as this is still missing on the new site? I am working in Singapore and Bintan and Batam are short ferry rides from SG and make nice weekend getaways. 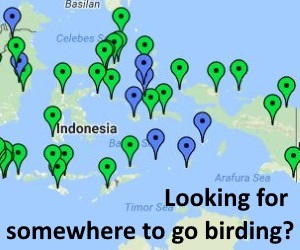 Are there any birding guides on these islands. (none were listed on Birding Pals). Maps are working again! Yippee!! Kris de Keirsmaecker and me, Rudy Lenaerts visited with Easter this year Halmahera. We saw two species not on the list of Halmahera, a male Cinnamon Bittern (Wetlands of Tans) and a male Tufted Duck (on a smale lake a few km from Golea). Tufted Duck (male) was on April 4 on a small lake a few km from Galela. Tufted Duck has been recorded as a vagrant in the north of the region a few times, including North Sulawesi, so a great record. Thanks for posting! We recently visited Manuk Island in the Banda Sea with SeaTrek Sailing Adventures. We saw Frigate Birds, Brown Boobies? and probably many other birds we did not recognise. Is there a site which describes in detail the sea birds on this island? Very little is published on Manuk, so your records are important. One old reference that includes Manuk is this one: Cadee G.C. (1985) Some data on seabird abundance in Indonesian waters, July/August 1984. ARDEA 73 (2): 183-188, which you can find a copy of on the internet? Hi,I am a bird watching fan.Tomorow I go to Wuasa in central sulawessi ,in Lore Lindu National park,My guide says than innDanau Lindu it is a good place to bird watching .I would like you inform me whhat we can see and if its possible to find horn bills in that area. 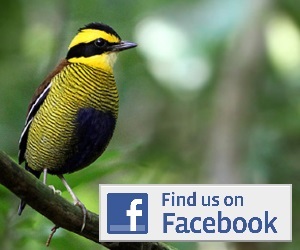 Hi good people..I’m Made Surya, birdwatching tour guide in Bali, Baluran and Ijen since 2012. I was born and live here in Blimbingsari Village West Bali which is buffer zone to the Rainforest West Bali National Park. Birds and wild live is my passion, has received guidence and support from TNBB as a bird guide as an effort in the corservation and economic development to the community around the Park. If you need a guide, yes I can help and I’ll be happy to guide you. I can create tour to suits you best. Hi all. The website has just moved server, so there may be a bit of disruption. Please just email if you spot a problem. Thanks! I will be visiting Bali in September and would like to spend a day birding. I will likely be staying in the Seminyak area. Is it feasible to hire a birding guide for a day, leaving and returning to my hotel there? If so, can you recommend one? Also, how many different species might one expect to see on such a trip?